Have you made a cake in a slow cooker or crock pot? This was a first for me … something to check off my “to try” list! This cake is moist, butterscotchy (if that’s a word), best served warm with vanilla ice cream and warm sauce. The sauce is made separate, from the cake, on the stove top. 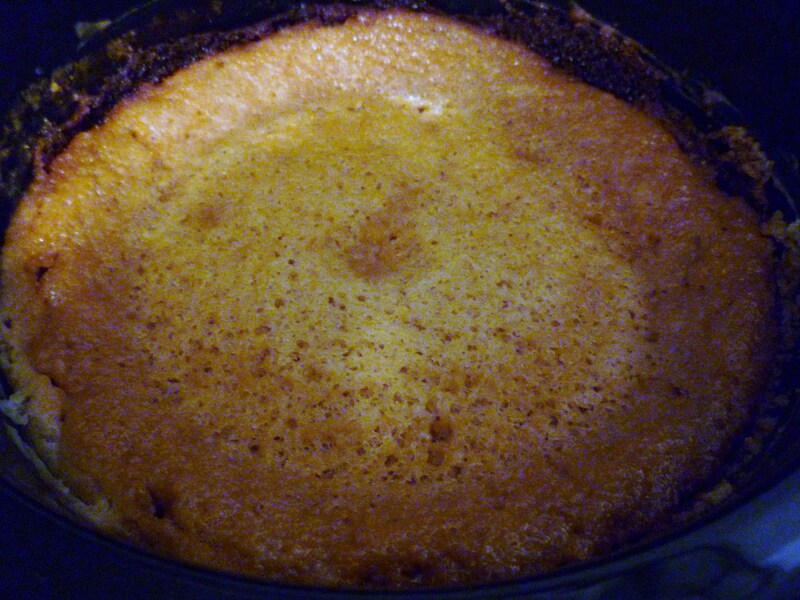 I cooked this cake at home … placed the crock pot in an insulated bag and drove it to my sister-in-law’s home. It stayed warm and yummy in the crock pot for several hours. I definitely will make a cake in a crock pot again! You will too, once you try it! I almost forgot to mention … you mix everything up in the crock pot … fewer dishes to wash, yeah!!! Place 4 eggs in your crock pot (I used a 6 quart size) and beat well. Add sour cream, oil and water … mix well. 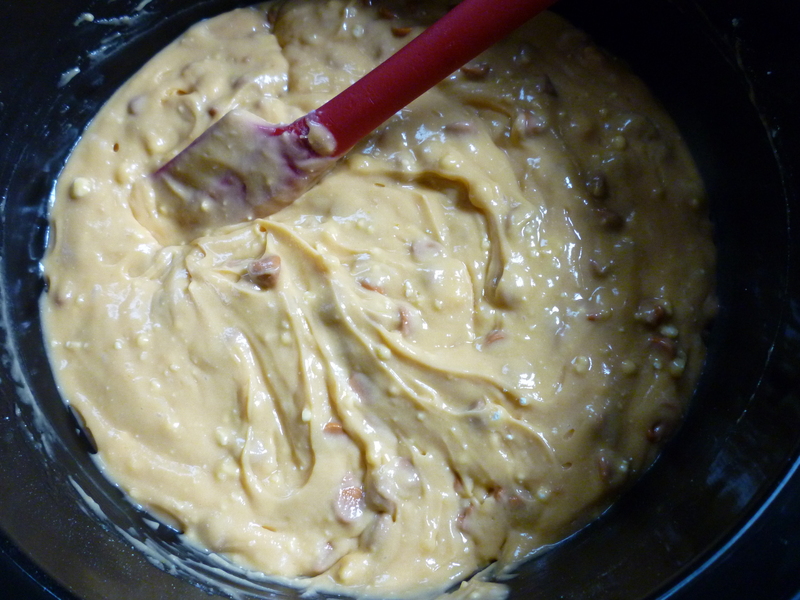 Add cake mix and pudding mix … mix well. Stir in butterscotch chips. Cover and cook on high setting for 3 hours. Heat brown sugar, syrup and butter over low heat to boiling, stirring constantly. Remove from heat, stir in cream and vanilla. Allow to cool and stir before serving. So what do think … I look forward to your comments! Brenda, I just got home from a senior citizens potluck at which I wowed them with Black Bean Enchiladas. Already I was wondering how I could wow them next month. 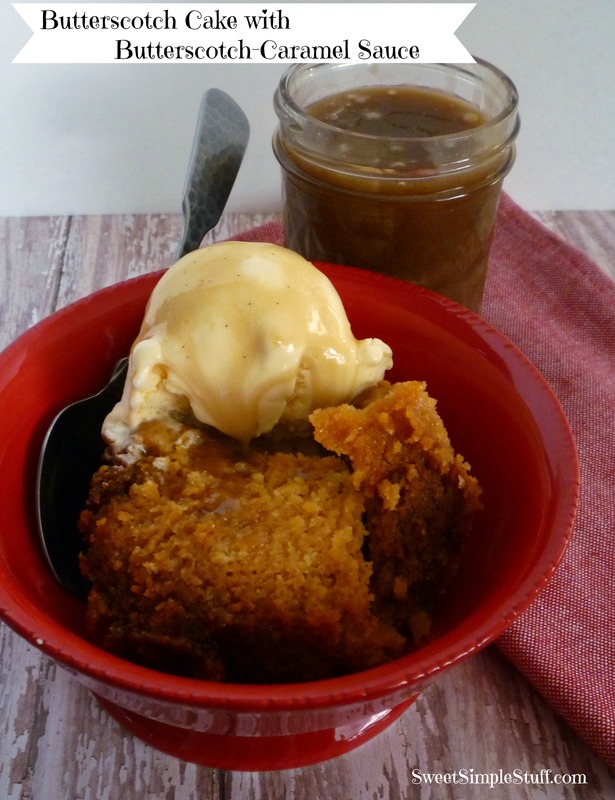 Your Butterscotch Cake with Butterscotch-Caramel Sauce might be just the thing!!! Since this was the first time I made it, I wasn’t sure about transporting and letting it sit while we ate dinner. I would recommend it for potlucks 🙂 Black Bean Enchiladas … yummo! The house did smell quite good … very tempting 😉 Your comment came thru just fine. It has been ages (a few years) since I have made a cake in the crockpot. I think it’s about time for me to make another; don’t you? Besides, hubby just finished off my apple cake that I had here so perfect time to mix up another. I just gotta get the butterscotch chips and sour cream today and will be good to go. Have a great day and better one tomorrow. , Hot Fudge Cake, Pineapple Upside Down Cake, etc. That’s what I can think of right off hand. Empty 2 cans of apple pie filling and put into the bottom of crockpot. Melt one stick of butter in Microwave and drizzle over cake mix. Crock on high for three hours. Have had the recipe for awhile so don’t even remember where I got it. I think someone had given to me. Person had made it, I liked it and asked for recipe. I have had a similar dessert … but never made in a crock pot 🙂 Simple … just the way I like it! You are going to get me in trouble 😉 I can feel the waistline expanding! That caramel sauce looks to die for! Thanks Brenda for letting us be your taster. It was delicious. I love butterscotch anyway. So I think I will try this on my own. How interesting! I definitely need to try this, I’ve never made a cake in the crockpot before. I have never tried a cake in the crock pot…but it sure sounds extremely delicious with all that melting ice cream on top!!! 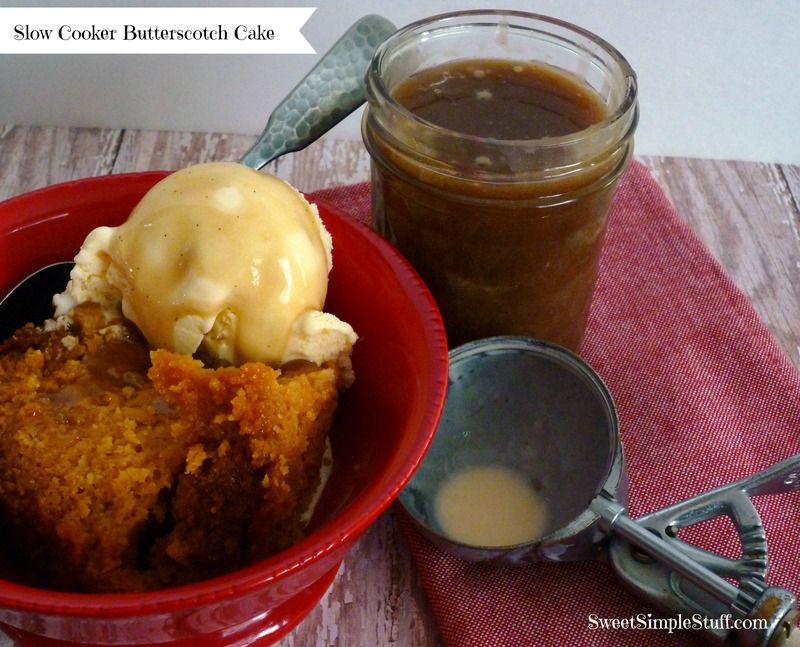 I’m not a fan of butterscotch, but this looks so yummy I might try this. Thank you for your time. Crock pot cake!! Oh man I did not need to this. I think this will be tonight’s dessert. This looks incredible! Do you mind if I use a photo and link for a roundup post I’m working on? Thank you Angela 😉 Please feel free to use a photo with the link. I love round-ups!